…there is world in which being friendly does not mean being agreeable nor disrespectful of differences, but rather encouraging the individual pursuit of excellence, a road and a goal that is accessible only to you, since we are all different by nature. In this world we learn by imitating, knowing that it will be impossible to be like those we imitate, since they already prevented us that it is not only impossible, but unethical. In this world we need to develop our own interpretation of beauty and demonstrate that it fits the community by concretely putting it into practice, in concrete actions. In this world your private life does not matter at all, as long as it does not interfere with the evolving public realm. In this world we are made aware, from the beginning, of the responsibility to be a role model for others. This world is absolutely transparent: we all know what we really need to know about each other, maintaining absolute respect for privacy (since it is not incumbent upon us), being that this transparency and the individual acceptance and respect of the codes of conduct established by the consent of the community, the checks and balances that maintain the cohesion of this world. This world does not measure success by quantifying your material wealth, but by the quality of your existence from the point of view of a creed that affirms the correspondence between ethics and aesthetics, not in words, but in concrete material actions that are visible, sensible, that occupy space and time. Thank you! 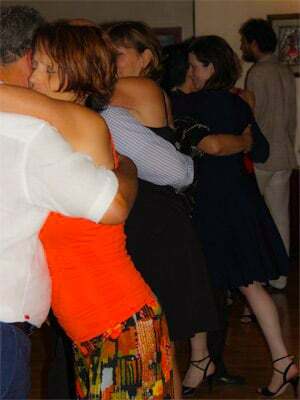 It is what Tango brings to everyone.